- Open the Play Store app on your smartphone or tablet, search for Cloud Softphone and install it. 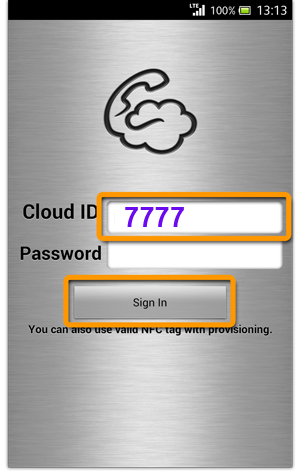 - Under Cloud ID enter 7777 and tap the sign in button (DON'T enter password here). - Enter your account username/password, and tap the "OK" button. - Once you see status "registered" is displayed, you are ready to place your calls! * To re-enter the username/password, or to change account, tap the application's menu button -> "Settings" -> "Account Settings".